Football season is almost officially here and if you have been a Patriot's fan over the past decade then you know how well they have been doing, for multiple reasons. A few years ago, I learned one of their secrets to improved speed, power, and injury prevention. This secret was so guarded that when an athletic trainer let it out of the bag, he was fired. Professional sports is about winning. When you really have something that works in the NFL you keep it a secret. Coincidentally, this same trainer was picked up by the New York Giants a year before they upset the Patriots in obtaining their "perfect season" in the Super Bowl. So, how does someone like me learn this secret? Well, the main person who developed this along side the athletic trainers was a chiropractor who focuses on structural correction of the spine. It just so happens, that this is what our office focuses on as well. We are a smaller subset of the chiropractic community that really has really has an enormous amount of research behind us. You see traditional chiropractors generally improve range of motion, decrease muscle spasms, and decrease pain. While our initial interest is the elimination of your pain, our fundamental goal is to restore your spine to as close to normal alignment as possible. While that is not always possible, it's important to understand that the closer the human body is to its normal alignment, the better it will perform. What the athletic trainers noticed was that players with good lower back alignment and a normal lordosis (normal side view curvature), were the most flexible, the fastest, hit the hardest, and had the least hamstring injuries. When the Patriot trainers went to the NFL combine, they spent 3.5 million dollars on tests like x-rays & MRI's to assess the health status of 325 players. The Patriots used these diagnostics to look for evidence of a bulging disc, pinched nerve or spinal stenosis. Clearly, they only wanted to draft and keep players that have no evidence of back problems. When a player had these conditions they were more likely to experience pain and a disability to play. To keep these conditions from becoming an arthritic (chronic wear and tear) condition, the athletic trainer's second goal was to find a treatment that would put the vertebra in the correct position and therefore correct what was causing the pinched nerve, bulged disc and the spinal stenosis. This is where the Structural Chiropractor comes in. This chiropractor had already been working on structural correction with his own patients in his office when the athletic trainer, who was the medical and rehab director for the New England Patriots, contacted him. He was asked to not only design a program of care for their players, but to also establish a routine the players could do to protect their spines once they were in normal alignment. The simple goal was to produce physically dominating players that stayed healthy throughout the season. Keeping your starting players on the field from beginning to end makes for a winning combination. This is not a new goal to any sports team; its just that the New England Patriots were the first to recognize the importance of a normally aligned spine. I've just recently heard that the Denver Broncos are now on board and I can't say I'm very happy about that. The good news for you is that this technology and treatment is available in our office. For all individuals to function at peak performance & be the best they can be, it's vital that your spine is as closely aligned to normal as possible. To schedule a complimentary consultation, give our office a call. 781-826-5555. If you are a parent, you probably enjoy the office supply store ad which uses a winter holiday song "Its the most wonderful time of the year." If you're a teenager, well...maybe not so much. Either way one of those supplies that you might need this year is a backpack. This is actually a very important choice for the health of your child's spine. Backpack usage has been correlated with the rise in adolescent back pain. There is also evidence that adolescents with back pain are more likely to have back pain as an adult. As the twig is bent, so grows the tree. It shouldn't be much of a surprise that if your child is carrying more weight on their back than they are capable of handling, then they might experience back pain. What most people forget is that this stress takes place daily over the course of the school year as your child's spine is growing. Now take into consideration that the backpack is worn incorrectly putting more stress on one side of the body. This will cause the child's structure to shift out of NORMAL alignment putting abnormal stress on the muscles, ligaments, discs, bones and nerves. When done long enough, this will lead to secondary symptoms such as back pain. Quite often the childs spine will develop a scoliosis (abnormal shift in the spine). Research has shown that just 26lbs carried at least one time per week is enough to affect your child's structure. There really is no perfect solution. Kids seem to need more books these days; some schools lack lockers and/or are not giving kids sufficient time to get to their lockers. We also can't overlook the fact that even with out these factors, some kids will just not be compliant to change the way they carry their backpack. But here are some suggestions that can help. 1. Make sure your child is not carrying more than 10-15% of their body weight in the backpack. not hang more than 4 inches below their waist. This way they are less likely to lean forward due to the increased weight on the shoulders. 3. Make sure the shoulder straps are adjustable and are padded for comfort. 4. Do not buy a backpack that is too big. Remember if there is extra space they will fill it with something, increasing the overall weight of the back pack. 5. Having individualized compartments is good. This allows the pack to be balanced and prevents bulky areas from pushing into the spine. 6. Roller packs are not a solution due to the fact that they get over packed and eventually the child needs to lift the pack onto the bus and up stairs at school. A lot of schools have already banned the use of these packs because of the space issue in the schools and fear of someone tripping over them. 7. If it seems impossible to limit the amount of books your child needs to tote around, talk to their teacher and see if there is an alternative, such as second set of books left at home or just bringing lighter books back and forth. If you have questions regarding your child's backpack and how it might be affecting their health, give our office a call. Consultations are no charge and if you bring your child we can make sure their back pack is set up properly. It as been said that in order to recognize “abnormal,” you must first be aware of what’s "normal". How do you know if you have a fever? How do you know if you have high blood pressure, high cholesterol, poor eyesight? You know what’s abnormal only because you know what’s normal. Many things in life have life have "normals". Your car, for instance, has warning indicator lights that are meant to light up when things with your car are "abnormal". Oil, engine, temperature, and now even tire pressure lights tell you when things with your car are not right ("abnormal"). These warning indicators are secondary to a primary condition (low engine oil, low coolant in radiator, and low air in tire). When it comes to the human body, our warning indicators are a number of secondary conditions (aka symptoms). Many times the cause to these secondary conditions is a more serious primary condition such as abnormal structural alignment of the spine. When the spine shifts into abnormal structural alignment, there is increased stress on the muscles, tendons, ligaments, spinal discs, and nerves. For example, the human head conservatively weighs on average 10lbs. For every inch it shifts forward from the shoulders you can add 10 more pounds to the head. I commonly see patients whose heads are abnormally 2-3 inches forward. That means there head is at least 30-40lbs! Do you think this would cause neck pain or headaches? Yes and Yes! There many more secondary conditions that an anterior head can present with, but that is for another blog. My point is that this increased physical stress can only be resolved by correcting the primary condition (abnormal structural alignment of the spine). As a Structural Correction chiropractic office, that's what I focus on and the results are amazing. Below are a small handful of secondary conditions that can common when there is a structural problem with the spine. Improved balance, strength, and stamina! From a Mouthguard? Yes it’s true! In the latest Men’s Journal there is an article which reviews these amazing benefits obtained from a special $2000 mouthguard. As the article states: “the gains weren’t huge while people were wearing the mouthguard, but they were statistically significant.” So significant that many top level athletes are getting this mouthguard made for themselves to get that competitive edge. Why am I even writing about it you might ask? Well because of the mechanism in which the mouthguard helps improve your performance. You see dentists have known for years that when a head has protruded forward from the shoulders (we call Anterior Head Syndrome) can cause TMJ disorders. I even remember writing a report about this in chiropractic school and most of my references were dental books. This particular mouthguard allows the jaw to move into its optimal position. This creates better head and neck alignment as compared to the lower body. In other words the head is not as far in front of the shoulders as it previously was. This decreases the strain on the neck and shoulder muscles, increases range of motion, and in turn opens up the rib cage making it easier to breathe and improves balance. My question is what happens when you take the mouthguard out? The guard, as good as it is, can only change a postural distortion while it’s in your mouth. What about the people who don’t notice much change with the mouthguard in? 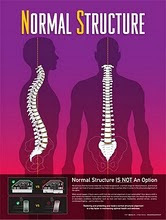 Many people have underlying abnormal structural problems that need extra help to correct.